Strength of the saturated condensation zone of a bentonite-bound mold material. 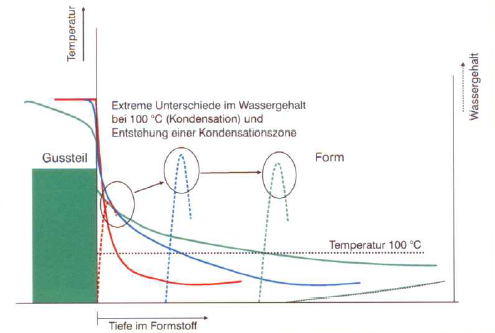 Due to the influence of heat (radiation and contact), a temperature gradient is formed in the mold wall which changes with the increasing exposure time, casting time and partially the solidification time. This leads to the evaporation and decomposition of water and other volatile components of the mold material and their subsequent condensation in the colder zones of the mold - the so-called condensation zone is formed (Fig. 1). This is characterized by a considerably higher water content than in the original mold sand (normally two to three times the water content suitable for the mold) and by temperatures which are close to the boiling point of water (approx. 100°C). The strength of this zone is therefore considerably lower than the green tensile strength and is determined first and foremost by the structural and physiochemical characteristics of the bentonite used (activation condition), the intensity of the conditioning (s. Sand conditioning) and the water content. The strength of a wet mold sand increases as a consequence of an ion exchange, generally known as activation. Here, the mold strength in the condensation zone, the wet tensile strength, usually increases first. Generally, well conditioned mold sands (quartz sands with 7% bentonite; under laboratory conditions) display wet tensile strengths of 0.40 to 0.50 N/cm2. Circulating mold sands display wet tensile strength values of 0.20 to 0.35 N/cm2, whereby values of around 0,20 N/cm2 are particularly striking. Fig. 2 shows the principle of the measurement. Circulating mold sands are heavily influenced by the type of bentonite, its activation, the conditioning and the “pollution” of the mold sand, such as through salt and the increase in condensates. Large amounts of fine-grain substances also decrease the wet tensile strength (Fig. 3). Fig. 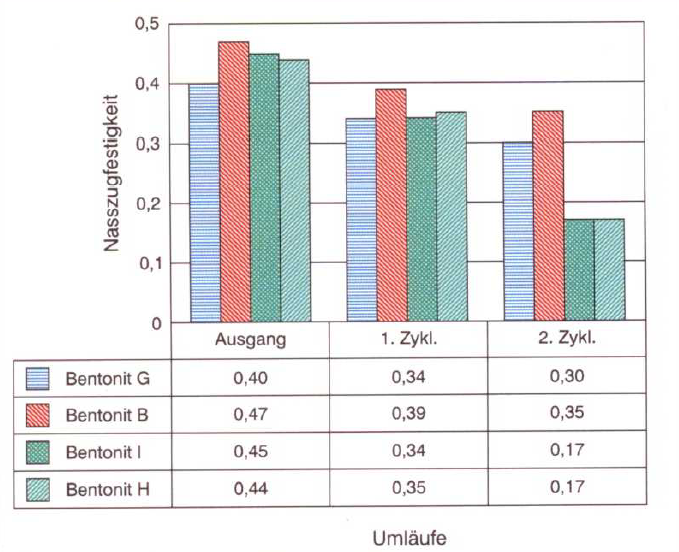 4 shows the test results of a laboratory test (carried out by S&B Industrial Minerals GmbH). 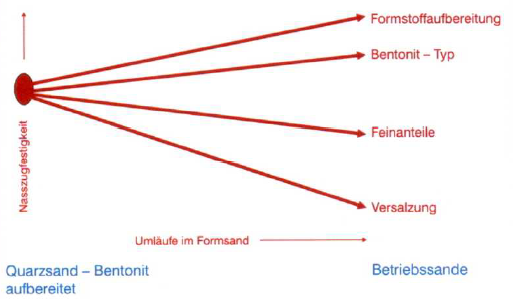 Quartz sand was conditioned with 7% bentonite in a muller 5 min normal according to information sheet P 69 from the VDG (Association of German Casting Professionals). After the mixture was exposed to ambient air for 24 hours and drying took place, it was reconditioned. During this conditioning, water mixed with sodium chloride was used. The amount of water added for the second cycle was 80ml with 1600mg NaCl, in relation to 6kg of mold material (420g bentonite). The amount of chloride added was therefore 965mg for 420g of bentonite or, converted, 2300mg/kg bentonite. This addition of sodium chloride roughly corresponds to possible salination due to the cooling and moistening water in the cycle system. A bentonite supplier has the opportunity to recommend bentonites which are less susceptible to a fall in wet tensile strengths. Whether bentonite or, more specifically, its main component, montmorillonite, reacts considerably to the presence of electrolytes is tested with sand conditioned in a laboratory. A strong reaction to over-activation with soda also indicates a low resistance to salination. The results in Fig. 4 show large differences in the wet tensile strength after the addition of electrolytes. It seems that a certain threshold is exceeded, above which the wet tensile strength falls sharply (level of 0.30 to 0.36 down to 0.17 N/cm2). Due to its low size, the wet tensile strength has a considerable influence on the formation of sand expansion defects in bentonite-bound mold materials (scabs, buckles, rat tails, veining and other defects). The wet tensile strength is an important characteristic for the evaluation of a bentonite-bound mold material and is determined with special testing devices (s. Mold sand testing).